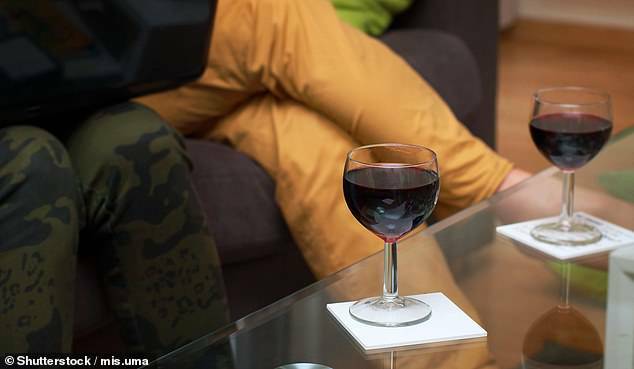 The team says previously touted benefits of wine – from preventing blood clots to lowering your blood sugar – only worked if you had no more than three glasses per week, or if you had a family history of heart disease. This was compared to those who consumed drinks three or fewer times per week – and was consistent across all age groups. ‘Consuming one or two drinks about four days per week seemed to protect against cardiovascular disease – but drinking every day eliminated those benefits,’ said first author Dr. Sarah Hartz, an assistant professor of psychiatry at Washington University School of Medicine. Those who live in one of the world’s five ‘Blue Zones’ – geographic areas with low rates of chronic disease and home to some of the world’s oldest people – may disagree. But Dr. Hartz believes the current recommended limit is too much. ‘A 20 percent increase in the risk of death is a much bigger deal in older people who already are at a higher risk,’ she said. ‘Relatively few people die in their 20s, so a 20-percent increase in mortality is small but still significant. Any protection against heart disease, stroke, and diabetes turned out to be not ‘statistically significant’. Dr. Hartz predicts that as medicine becomes more personalized, doctors may suggest people with a family history of heart problems have the occasional drink. ‘If you tailor medical recommendations to an individual person, there may be situations under which you would think that occasional drinking potentially could be helpful,’ said Dr. Hartz.